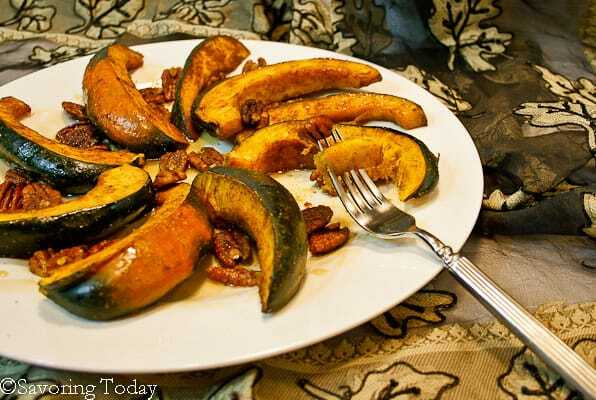 Somewhere along the way, Curry Roasted Acorn Squash & Pecans got lost in the shuffle of photos and blog posts. It’s funny how blog life mirrors real life, as good intentions get sandwiched between the unexpected and easily distracted. Acorn squash was one of the few squash varieties I liked as a kid. It probably had more to do with the brown sugar and butter Mom used than the squash itself. I imagine I would have liked any vegetable with a built-in pool for butter and brown sugar, so it wasn’t a hard sell for her. My own kids, however, would not be fooled by the lure of melted butter, even if it was “just like their cinnamon toast”. They couldn’t imagine anything making squash taste good, so acorn squash never passed their lips. As much as I adore the classic recipe, branching out from the tried and true opened the door to new shapes and flavors for this favorite. Slicing the squash along its ridges creates manageable crescent shapes for a more inspired presentation. It also cooks faster and takes on a deeper roasted flavor because the flesh makes contact with the pan to brown in spots. A garnish of roasted pecans and maple syrup brings a touch of sweet balance to the curry spice—I promise you’ll want a piece of pecan in every bite. 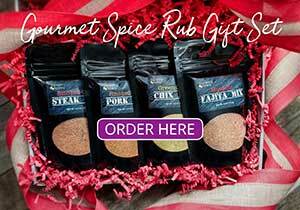 The curry spice in this recipe is easily customized. I like adjusting the spice for the mood I’m in—a little more ginger or cayenne because I love sweet and spicy, more cinnamon to remind me of home, or touch more coriander and cardamom for floral notes. Of course, you can use any curry spice you already have to make it even simpler. The beauty of this side dish is how easy it is to make and the way it complements any roasted, grilled, or pan-seared meats—perfect for adding a little spice to your holiday spread. What’s your favorite way to serve acorn squash? Acorn squash dusted with curry spice, roasted until tender, and finished with pecans and pure maple syrup. Preheat oven to 400°. Cut squash in half in the direction of the 'ribs'. Scrape out seeds with a spoon and discard. Slice squash along each rib into 1-inch wide crescent shapes. Place squash In a mixing bowl and drizzle with melted butter to coat. Add the curry spice and mix until squash is well coated with the butter and spice. Arrange squash on a parchment lined pan and bake for 20-25 minutes or until squash is fork tender. Spread the pecans on a baking pan and place on a rack in the oven just under the squash during the last 10-12 minutes of baking to toast pecans. Once the pecans are toasted and squash is tender, remove from oven and arrange the squash on a serving tray using tongs (squash will be hot). Sprinkle the pecans around the squash and drizzle with butter and maple syrup, as desired -- about 2 tablespoons of syrup and 2 tablespoons butter. 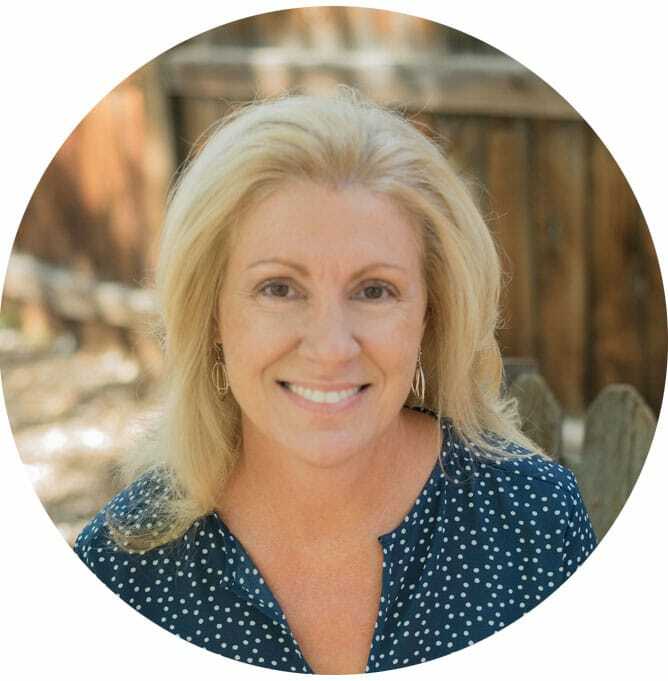 « The Sweeter Side of Candida Book Launch Giveaway — This week! 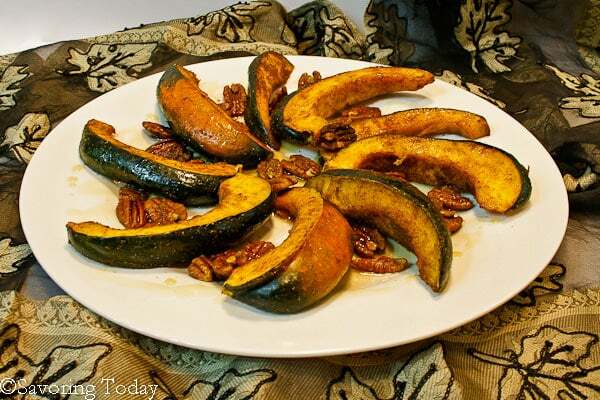 Acorn squash was my childhood favorite, too, and I’ve always had a pecan, cinnamon and sugar addiction. I can’t remember ever having acorn squash roasted or spicy, and my adult flavor fave is curry. Thanks for combining my food passions into this exciting seasonal recipe. Can’t wait to try it. 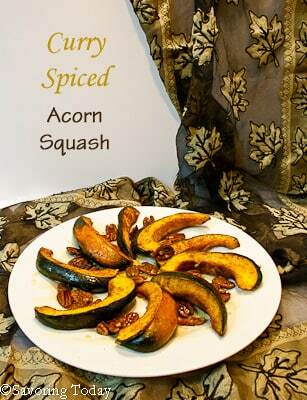 I love everything curried or with curry…This squash dish looks beautiful and quite delish! This was the last week for our farmers markets and I stocked up on Winter squash. Our supermarkets just don’t carry a large variety. Your post could not be better timed, Judy, and sounds delicious. Ill be sure to give this a try. Thanks for sharing both recipes.